A big thank you to Caroline Payne at Simon & Schuster Australia for sending this book to me for review. The noise between Patch and Nora is gone. They’ve overcome the secrets riddled in Patch’s dark past…bridged two irreconcilable worlds…faced heart-wrenching tests of betrayal, loyalty and trust…and all for a love that will transcend the boundary between heaven and earth. Armed with nothing but their absolute faith in one another, Patch and Nora enter a desperate fight to stop a villain who holds the power to shatter everything they’ve worked for—and their love—forever. We first meet Nora in the book as she is waking up in a cemetery at night. It is quickly obvious that she has lost her memories and does not remember anything past April, despite that it is now September. She returns home to find she has been missing for eleven weeks and many people have been looking for her. Nora tries to pick up where she left off and live her life as normally as she can, but she feels things have changed too much. Nora’s ability to get into dangerous situations without trying is yet again evident. Nora discovers her mother is dating Hank Millar, the father of her nemesis Marcie, and is understandably very upset. However, her childish behaviour annoys me – she attempts to walk home after a dinner with Hank, recognising it is dangerous but continuing anyway. In a trademark unrealistic plot twist – Nora happens across a group of fallen angels terrorising a Nephil. A mysterious character named Jev (whom the reader knows to be Patch) appears and saves her. The events that follow this clumsy reintroduction of the fallen angel world are remarkable similar to the first book of the series. Despite believing Jev is dangerous Nora begins to trust him and rely on him to save her in dangerous situations. She begins to have feelings to Jev, but is confused when she learns that she was dating a mysterious boy named Patch before her abduction. Nora’s inability to make the connection between Patch and Jev made me very frustrated. However, there were some very nice moments when dialogue from the first book between Patch and Nora was repeated – adding a sense of sweetness to their renewed courtship. Due to Nora’s amnesia, her mother and and best friend Vee attempt to conceal Nora’s past with Patch. I thought this was a great plot device with a lot of potential. Nora’s mother kept mentioning a man who wore all black as a possible kidnapper/stalker, and it took Nora a long time to realise that her mother was describing someone specific rather than generally guessing. Once she found out about Patch, Nora was understandably upset at Vee for keeping the secret from her. I found Vee’s comment about Patch ruining Nora’s life since she met him hypocritical since she herself has dated dangerous boys in the past. Otherwise this was a well executed plot device which I enjoyed. In previous works the author has set up Patch’s home as a mystery, never allowing Nora to see it. Thus Nora’s induction into Patch’s home was a lovely symbolic part of the book which I really enjoyed. I thought it signified that Nora was finally worthy of Patch’s love, and I liked reading all the scenes which were set there. The space also seemed very ‘Patch’ and was described beautifully. The third book of this series is by far the best – with Nora finally growing up and taking responsibility for her life. The relationship between them has also matured over the course of the books. 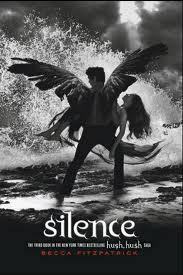 I am looking forward to the fourth and final book, with Patch and Nora taking on archangels together.